Lots of chaos as Lady Pole is dragged screaming into the house after trying to kill Norrell and the injured Childermass is taken in to be treated. While doing so he has an odd vision about ravens and cards. Of course Norrell is most upset about what this will do to his reputation and the reputation of magic – after all, he was the one who drove Lady Pole insane. His minions insists they can pretend the attack was a French spy and quietly shuffle Lady Pole off to an asylum. When Childermass wakes he finds Norrell there, not out of concern, he wants to know why Childermass was using the magic he taught in the square – Childermass says he sensed magic and he thinks Lady Pole is a magician because he sensed power on her. Norrell insists that was just the magic he used to return her from the dead though Childermass doesn’t believe him. He also makes a completely unfair remark about how useless Childermass has been recovering – then apologises. There is some heart to the man. Of course he also expects Childermass to take care of Lady Pole – after all if she is put in Bethelem, people can pay to stare at the insane and there may be TALK! Norrell and Jonathan have been called in to meet the King himself – King George the third, the Mad King. Though as Norrell points out, they cannot cure madness with magic but Jonathan is willing to try – and what could be more respectable than performing magic for the crown? Arabella craftily questions her maid about the real culprit who attacked Norrell and, through servant’s gossip, learns it was Lady Pole and she will be shut away. Norell and his minions work on the book one of his minions, Lascelles is writing about how awesome Norrell is and how utterly terribad wrong all past magic was. With extra emphasis on how impossible it is to cure magic (though John isn’t so sure on that especially as he would like to heal Lady Pole for the sake of Arabella). Jonathan wants to try that naughty, bad, disrespectable magic. Which Norrell quickly spins not only in condemnation of past magic but also a statement of how impossible it is since the fact of it is so swamped with myth and rumour. Despite that, next time he visits the king Jonathan tries some forbidden magic and the king awakens from his fugue to speak about how he sees The Gentleman. He seems to hold a conversation with the Gentleman about the kingdoms each of them rule. Jonathon assumes he is rambling – until he walks into a mirror and disappears. The king reappears on the road in front of where Stephen and a servant are driving Lady Pole in a carriage. Stephen asks if he can help – and a sword appears in his hands which then magically drags itself (and Stephen) towards the king. Jonathan manages to summon the king back magically just before Stephen kills him. The king speaks again “this act will have consequences, magician.” Then he lapses into confusion. The Gentleman tells Stephen, rather irritated, how Jonathan totally thwarted his king killing plans. Steven points out the flaw in the plan – killing the king would just pass the throne to one of his children and there’s absolutely no way Stephen, a Black man, would be hailed as king. The Gentleman still doesn’t see to grasp that but, again, focuses on “taking” Arabella. Jonathan goes back to Norrell with more theories on magic and fairies and mirrors – and Norrell is, of course, firmly opposed. Jonathan tells Norrell about the magic he used in Portugal – and that it worked but Norrell continually makes excuse not to study it and how they should all pretend that all old magic simply doesn’t work, all evidence to the contrary. While back his house Arabella is worried when his friends report that Jonathan disappeared by mirror though he enters (through the door). In his enthusiasm for the magic he’s quite dismissive of Arabella’s worry. She is horrified that he is doing such dangerous and unknown things – especially since he has returned from war and she is not happy for him to take further risks. They argue angrily him pointing out she wanted him to get a respectable profession while she hits back she never argued against his profession but the fact he has abandoned his books for far riskier methods. She leaves, furious and cursing magic. Drawlight appeals to Lascelles but Norrell is incensed with him and his fraud – after trying to claim how much they need him he resorts to begging for help, trying to excuse himself by pointing to his massive debts. Lascelles offers him a chance – but with a death threat attached. And then shops Drawlight to the authorities. And Norrell goes further – there is an unrepealed law on the books allowing for a magical court which Norrell insists on for Drawlight since his crimes were against magic. He wants a court to protect himself from evil magicians assault and… disagreement. Which Sir Walter is quick to point out – disagreement isn’t a crime and not a court’s job to censor. If another magician disagrees with him he must debate and endure criticism. When Norrell suggests the court would have Drawlight hanged Jonathan objects; he’s been at war he doesn’t want to see more death. Norrell derails the conversation to rail at Jonathan for his discovery of the Kings Roads behind the mirrors. 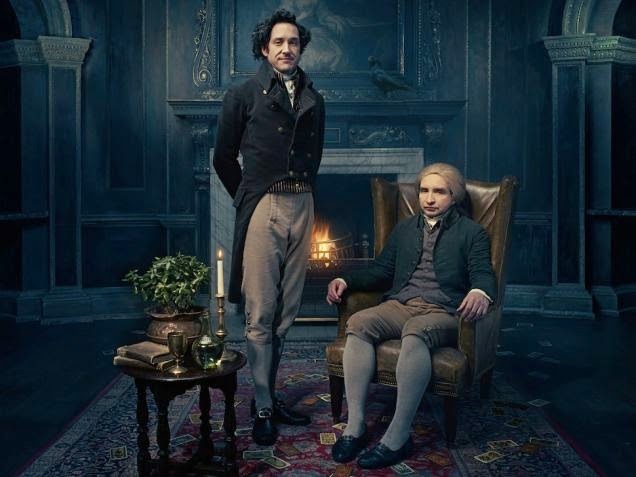 Jonathan rhapsodises how amazing it is – but Norrell will not listen even as Jonathan finally challenges him – why come to London, why practice English magic if he won’t do English magic? Norrell returns again with his respectable line – and Jonathan leaves but not without a copy of Lascelle’s book. His review is not well received by Lascelle’s as his review says clearly he doesn’t want to be modern, he wants to embrace the mysteries and dreams of the past. He calls Norrellite blinkered and dull and restrictive – mundane and even afraid. Norrell and Jonathan take tea (which is so amazingly English) to discuss their positions on the Raven King which really sums up them both; wild and uncontrollable or reasoned but mundane. They are both intensely polite even as they acknowledge their period of collaboration is over. Norrell also points out they are the only 2 magicians in England if they do not talk to each other they can talk to no-one, they will be alone. Norrill even suggests them being equal – he doesn’t want the partnership between them to end but Jonathan insists he must go his own way. Unfortunately he then gets news that Napolean has returned from exile – which means Jonathan is again called to war. Not something he can refuse. Stephen continues on with Lady Pole and takes her to the asylum – one run by Segundus and Honeycut for some odd reason. Lady Pole is horrified to realise they’re magicians even as they claim not to be Norrell’s friends. She begs Stephen to take her away, but he leaves even as she screams for him. She begs them to untie her – she is sick of “men in coats describing what is best for her.” With the added commentary that, yes, she may very well hurt herself but she belongs to no-one but herself. She is chained every night, she will be free. But as he leaves Segundus asks Stephen about the magic around him and Lady Pole – he can see it including the roses that gag them. Stephen denies all knowledge and leaves, even as that mean walking past The Gentleman. The Gentleman also has Stephen retrieve something to use against Jonathan from a mire which he turns into a copy of Arabella. The conflicts I’ve already spoken about in the past episodes continue – and continue excellently. But we’re also introduced to more which just adds to the layers and richness of the show. We have Norrell’s ongoing deception and the whole respectability vs old magic – with more levels added as Norrell both goes ever darker to try and cover himself up but, at the same time, Drawlight’s fraud shows just how much magic CAN be abused. There’s never a simple “Norrill is wrong, Jonathan is right” narrative, there are always more levels. We also have, I think, a different approach to magic. Norrell looks at magic as a tool – not exactly for getting things done but for enhancing his reputation and his position. He wants a book, he wants to be hailed, he wants magic named after him. While Jonathan is interested in magic for its own sake, he wants to study the old ways because they fascinate him. He is almost childishly excited by the adventure of discovery – he studies magic to learn about magic not for what it can bring him. There is also some personal conflicts – like Stephen. Obviously he is being used by The Gentleman but between the subservience he is forced into and the tantalising power The Gentleman offers (as well as the unspoken threat of Lady Pole) coupled with his harsh exposure of the lies Stephen tells himself, is it any wonder he continues to work with him? And is Lady Pole, seemingly free from Norrill and with the magically sensitive Segundus, going to become more than a mere victim? Jonathan and Norrell work so well together. They are opposites, they object in many ways, they are in repeated opposition often vehemently. But they do respect each other and, as Norrell points out, they are the only peers each man has.